It’s been a while since I posted something in the blog, I am sorry, i had a lot of material in all this time for at least making a few post but honestly i didn’t felt like doing so. First of all i have to say that the Ubuntu 10.10 is currently in beta status and its final release is due to October but i find so many issues with Ubuntu 10.1o netbook edition that i honestly don’t think most of them cant be solve in the time left. Also i tried OpenSuSe 11.3 in my netbook and finally Kubuntu 10.10 and 10.04 LTS. Which one of them i decided to let install in my netbook? The story goes like this. I had on my Acer Aspire One netbook Ubuntu 10.04, it worked perfectly on the netbook, fast, secure, pretty interface, all the good stuff you get just by using Linux 🙂 Then suddenly i just decided to upgrade to the Ubuntu 10.10 Beta just to test the new Unity interface on my netbook. The experience wasn’t so nice honestly, 10.10 was very slow in every aspect, programs take very long to load and well everything in general was slow. About the interface well the new Unity needs a lot more work, the sidebar on the left don’t have auto-hide function, it take a lot more space in the screen than the old Ubuntu Netbook interface, so now i had less space to browse the Internet, applications and everything in general. I know is a beta and 10.10 its still one month away from release approximately and there is a lot to fix. Then i decided to remove Ubuntu 10.10 from the netbook completely and try other thing, the one i choose was yet another beta Kubuntu 10.10 for netbooks. Everything was fine with it for a while, i downloaded a few basic programs and ran it like 1 or 2 days everything working fine but suddenly i updated 10.10 and the updated caused the Kubuntu daemon to crash on every start and the wifi stopped working, i tried everything but didn’t make the wifi work again so i got tired of it and decided to try a new distro, OpenSuSe. OpenSuSe 11.3 looked nice but there was a program with it, i couldnt make the OpenSuSe image bootable on the USB, i tried unetbooting, the ubuntu application to make bootable pen drives and nothing worked, the only thing that worked was via terminal. I booted the netbook from the OpenSuSe bootable USB and test it first, all was fine but suddenlyon the install the screen turned black and i couldnt intall OpenSuSe, i tried multiple times but no results. Finally i got tired of everything and downloded Kubuntu 10.04 normal edition, not the netbook one because you cant change from plasma to normal KDE interface in 10.04, you can on 10.10 which i loved, and i dont like the netbook plasma interface much. 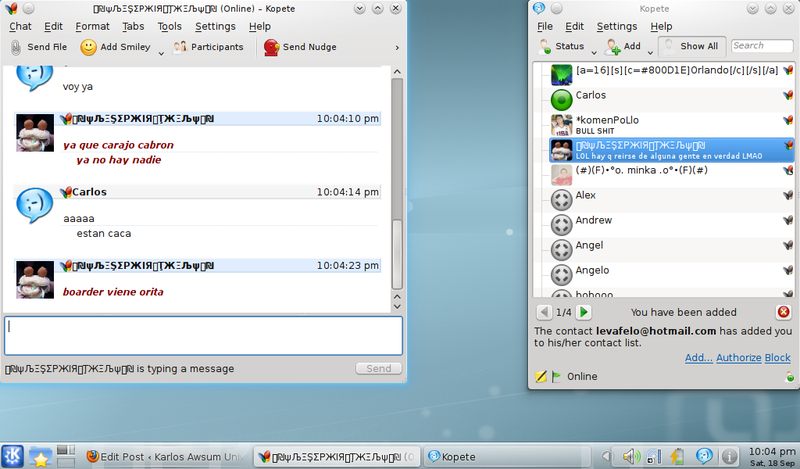 I just made the KDE taskbar to autohide and the windows to maximize and it works perfectly on the netbook. Is a little slower than the gnome interface but nothing serious, runs almost the same. Im loving Kubuntu on my netbook, runs fine and have a pretty interface. The screenshots in this post are from 10.04.